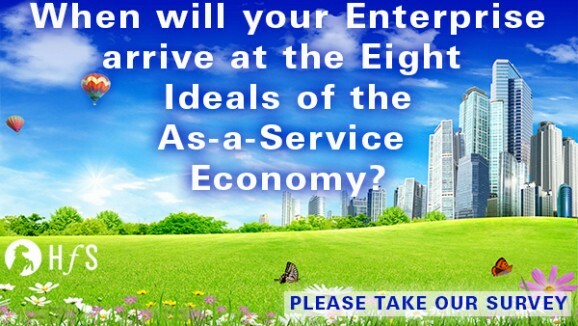 Is your enterprise ready for what the future has in store for us? This emergence of "As-a-Service" represents the most disruptive series of impacts to the traditional IT and business services industry that we have seen. The globalization wave is peaking, and many maturing enterprise service buyers are struggling to find incremental value from the traditional outsourcing model, such as accessing more meaningful data, achieving better automation of processes, deploying end-to-end process delivery and accessing talent with creative business thinking skills. At the same time, service buyers need to keep driving down their operating costs to a minimum, with globally accessible technology platforms, based on common standards enabled by the cloud. Looking at this next evolution of value, it is coming from technology-driven “As-a-Service” advancements that directly enhance employee, partner and customer effectiveness. In short, the way service buyers receive services, and the way service providers sell and deliver them, is going to be very, very different in a few short years, and already some process areas where the technology is already available are being impacted. So how is your organization shaping up against these Ideals - and what is most important to you? Whether you buy, provide or advise on business and IT services, your opinions and intentions are critical for our research, so please spend some time completing our study and you could win an Apple Watch. Please note that your contact details will only be used for the purposes of sending you the optional executive report and entering you into the prize draw for the Apple Watch. So please take our survey to air your views and experiences.